For the street in Grand Theft Auto V, see Grove St.
Grove Street in Ganton, showing the cul-de-sac (foreground), and East Los Santos (distance); as depicted in Grand Theft Auto: San Andreas. Grove Street is a cul-de-sac in Ganton, Los Santos, which is the main base of operations for the Grove Street Families. It is based on Rosecrans Avenue in Compton. Grove Street is the home of Sweet and Carl Johnson, the leaders of the Grove Street Families. They, along with their two siblings Kendl and Brian, were born and raised in the Johnson House. Beverly, their mother, continued to raise her three remaining children (Brian had died in 1987) in Grove Street, until her death during a drive-by shooting on her house. Her son, Carl, returns after leaving for Liberty City, and begins living in her house. Sweet, although no longer living in the Johnson house, continues to live in Grove Street. Kendl now lives in El Corona with her boyfriend, Varrios Los Aztecas leader Cesar Vialpando. Ryder and OG Loc also live in Grove Street, and Big Smoke had lived in Grove Street until moving to Idlewood. Grove Street, as the main base for the Grove Street Families, comes under attack from Ballas gang members. One instance is the drive-by shooting that led to Beverly Johnson's death, and when OG Loc hosted a party at his house; three waves of Ballas members attempt to take Grove Street, although they ultimately fail. However, following the arrest of Sweet and the forced re-location of Carl (by C.R.A.S.H. ), Grove Street and all other Grove Street Family territories fall into the hands of the Ballas. This is helped by Ryder and Big Smoke, who had aligned themselves with the Ballas. Sweet is later released (via Mike Toreno) and Carl returns, and together they re-claim Grove Street and Ganton for the Grove Street Families. Grove Street once again becomes the main stronghold of the Grove Street Families, who use Grove Street as a base for expanding into other districts (such as Idlewood). Following the acquittal of Frank Tenpenny, Grove Street residents (along with residents of Los Santos) begin rioting. Carl and Sweet manage to 'lockdown' Grove Street, and bring stability to Ganton. 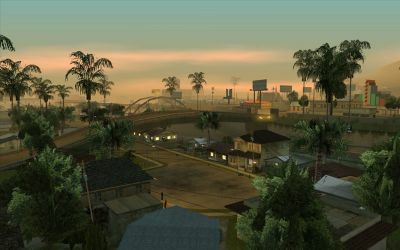 Grove Street serves as the place of death of Tenpenny, who dies after crashing a Fire Truck off a bridge and into Grove Street. Kendl Johnson (? - 1992, moves to El Corona to live with Cesar Vialpando). AK-47 - Inside the Johnson House after spraying over all tags. Brass Knuckles - Under the overpass next to Ryder's House. Camera - On the second floor of the Johnson House. Molotov Cocktail - Inside the Johnson House after spraying over 100 gang tags. Micro SMG - Underneath the bridge leading from the Los Santos Forum to Ganton. Pistol - Behind the second house north of Sweet's House. Sawn-off Shotgun - Inside the Johnson House after spraying over 100 gang tags. Spray Paint - (x2) On the second floor of the Johnson house after completing Tagging up Turf, and one on-top of the shop behind the Johnson House. Tec-9 - (x2) One on top of Sweet's House, and one inside the Johnson House after spraying over 100 gang tags. BMX - Parked in front the home next to OG Loc's house. Greenwood - Parked in front of Sweet's house. Hydra - On top of Sweet's house after gaining 100% completion of the game. Picador - Parked in front of Ryder's house. Rhino - Parked under the overpass next to Ryder's house after 100% completion of the game. The name Grove Street may be a reference to a real street in Edinburgh, Scotland, close to where Rockstar North are based. Grove Street, as viewed from the overpass adjacent to Ryder's house (far right). This page was last modified on 25 March 2014, at 22:37.